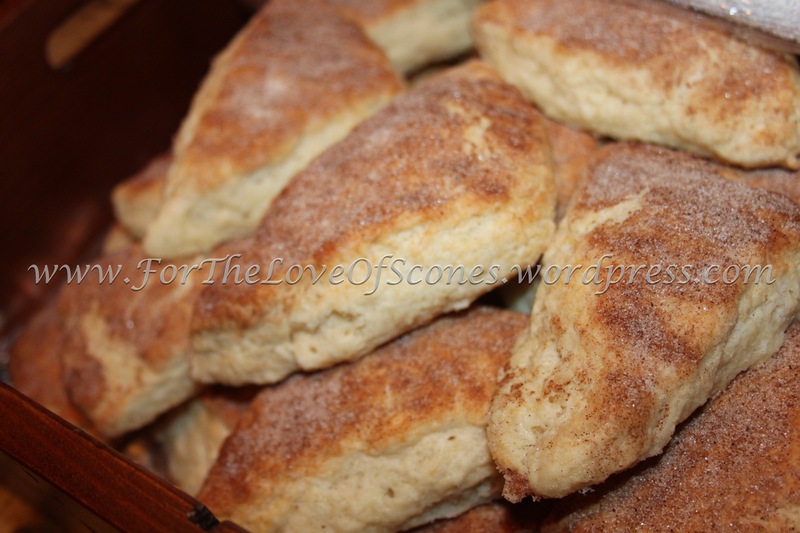 And, if I haven’t mentioned it before, I love getting new scone recipe suggestions. It’s so much fun to try and come up with a recipe that is exactly what someone asks for. 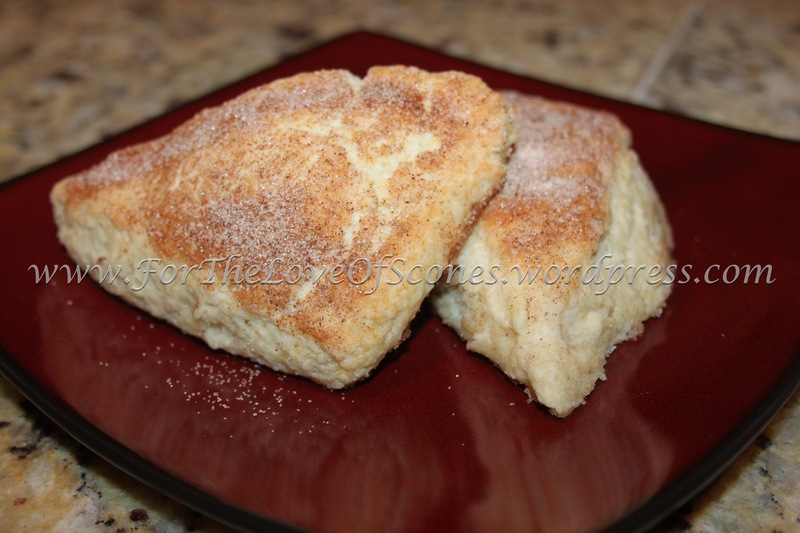 So when I was asked for a Snickerdoodle scone, I knew that I’d have to eventually come up with one. I’m only sorry that I waited so long…I’m trying to resist making another batch, because although they are DELICIOUS, they probably aren’t very good for you. Crusty sugar on top, fluffy and flakey in the middle. To be honest, this one took me a couple of attempts. I wanted to keep the Snickerdoodle flavor but turning it into a flakey scone proved a little more tricky than I anticipated. I didn’t want to be pulling a cookie in a scone shape out of the oven, after all. My first batch had far too much liquid and sugar in it, so I reduced both and came up with this one. 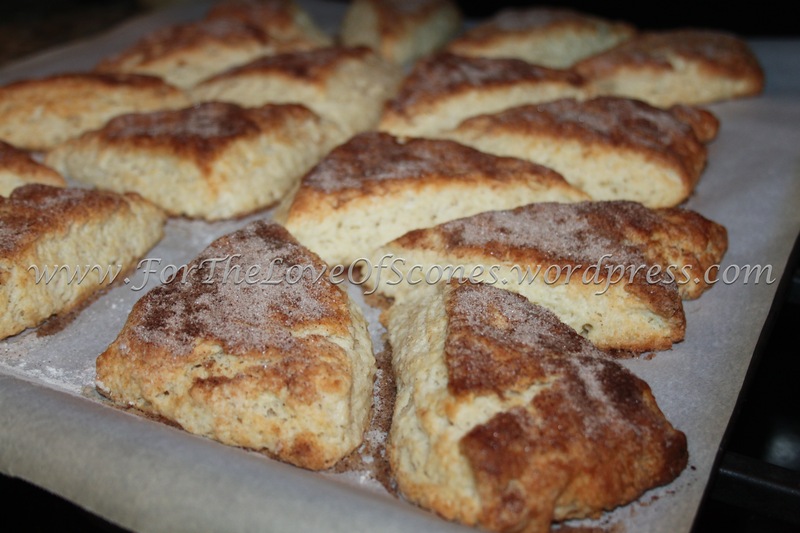 I did significantly reduce the sugar, and while the first batch “tasted like a cookie” according to my hubby, I was worried that too much sugar would make the scones flatten out. That said, if you want that truly authentic “cookie flavor,” you can up to double the sugar that I have listed in the ingredients–but make sure your dough is not too sticky and soft when you cut them, or else you’ll have a pancake and not a flakey scone coming out of the oven. Good luck, and I hope you enjoy them as much as my tasters and I did! 1) Preheat the oven to 400°F. Combine the topping ingredients, whisking the sugar with the half tablespoon of ground cinnamon and a dash of nutmeg. Set aside. 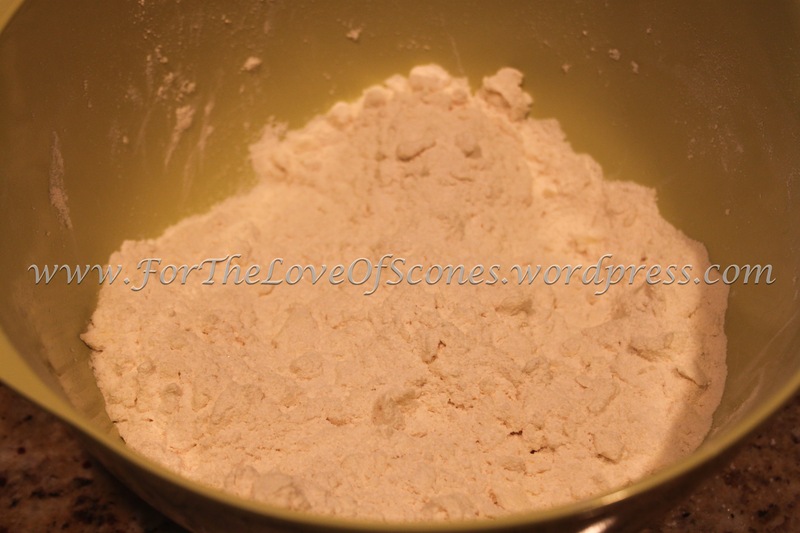 2) Combine dry ingredients: flour, sugar, cream of tartar, baking soda, and salt. Whisk to mix. 3) In a small bowl, combine the egg and vanilla. Whisk lightly to mix. Add the Greek yogurt to the egg and vanilla mixture and whisk well to combine. Set aside. 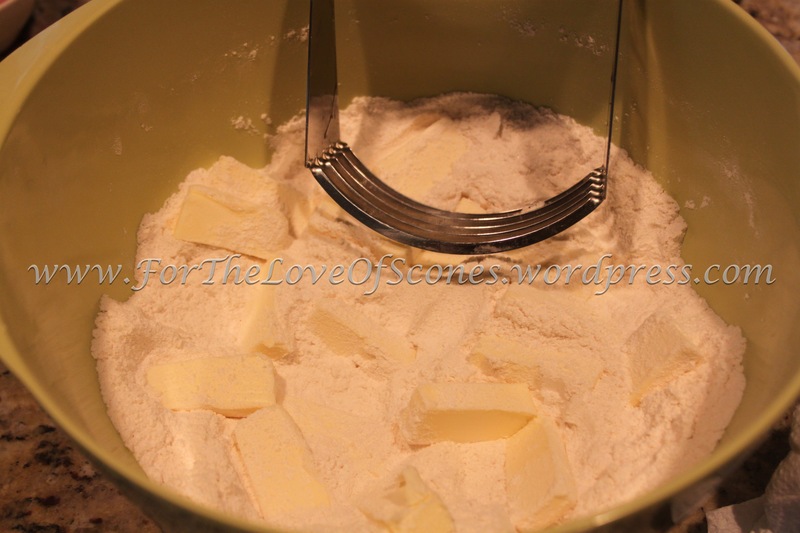 4) Add the chilled, chopped butter to the dry ingredients and work in using a pastry blender or your fingertips until the mixture resembles coarse sand. 5) Add the egg and yogurt mixture over the dry ingredients and stir with a wooden spoon to mix. 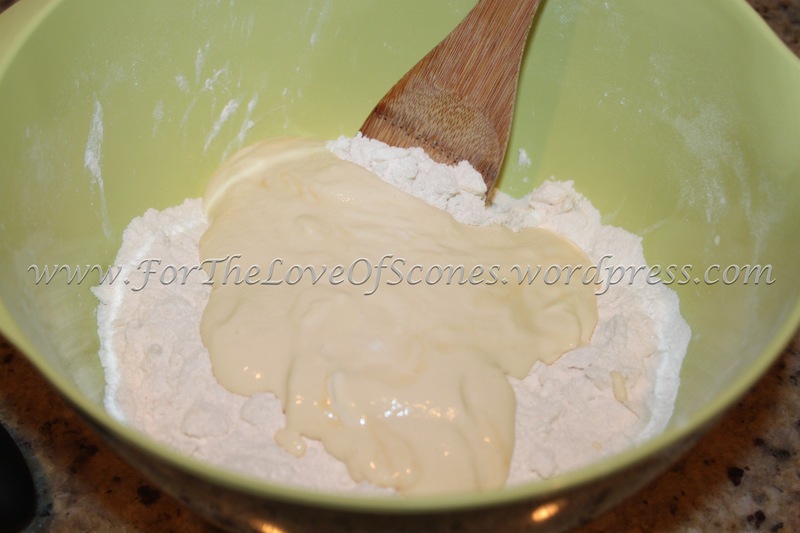 Add the half & half a tablespoon at a time until the dough just comes together. 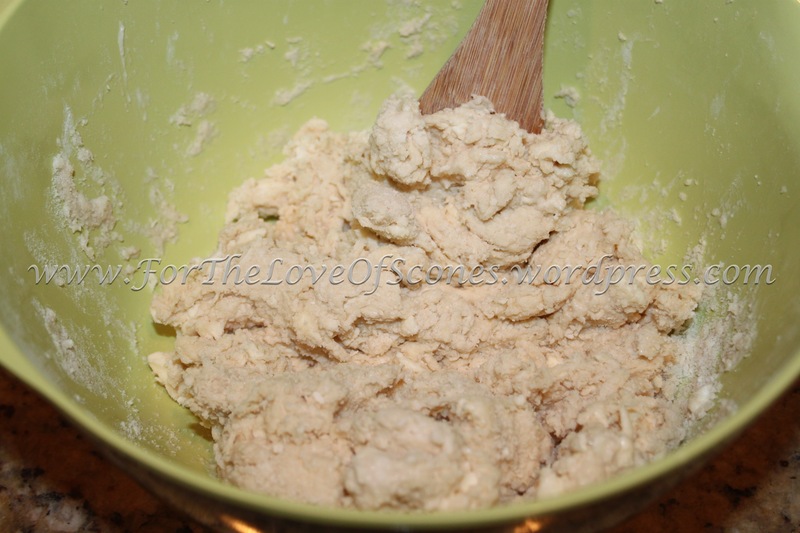 6) Turn out onto a floured countertop and knead a few times to bring dough together. Flatten into a log (or two rounds) and cut into 16 equal triangles. 7) Place on a parchment-lined baking sheet about two inches apart from one another. Sprinkle liberally with the sugar topping. 8) Bake at 400°F for 15-20 minutes, or until golden and cracked on top and sides look baked. 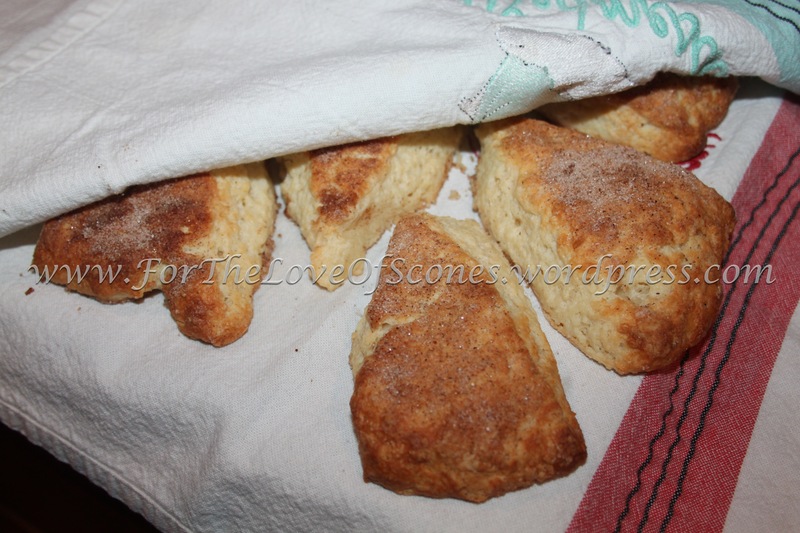 9) Remove from oven and place scones onto a towel-lined cooling rack. Cover or tuck in the scones with another towel and allow to cool. 10) Enjoy warm or cold. As always, measure out your ingredients first, and mix your topping. 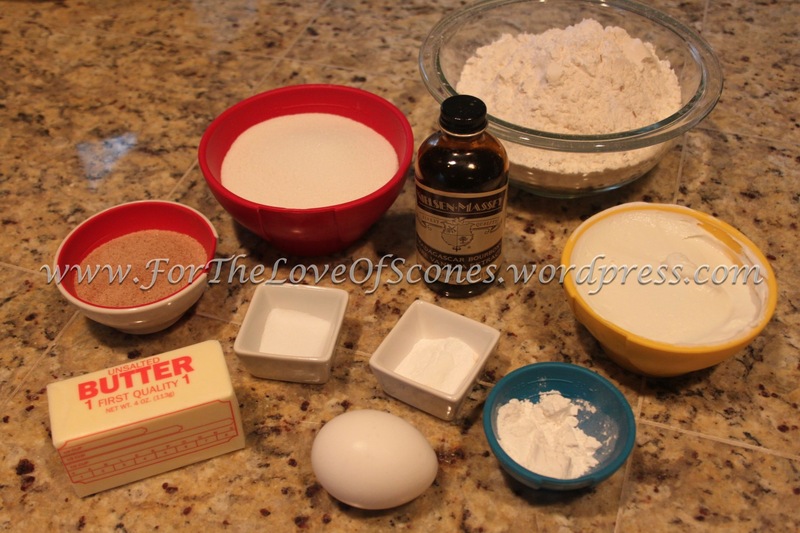 Combine the dry ingredients: flour, baking soda, cream of tartar, salt, sugar. A few larger chunks of butter are okay, but try to get it uniform. 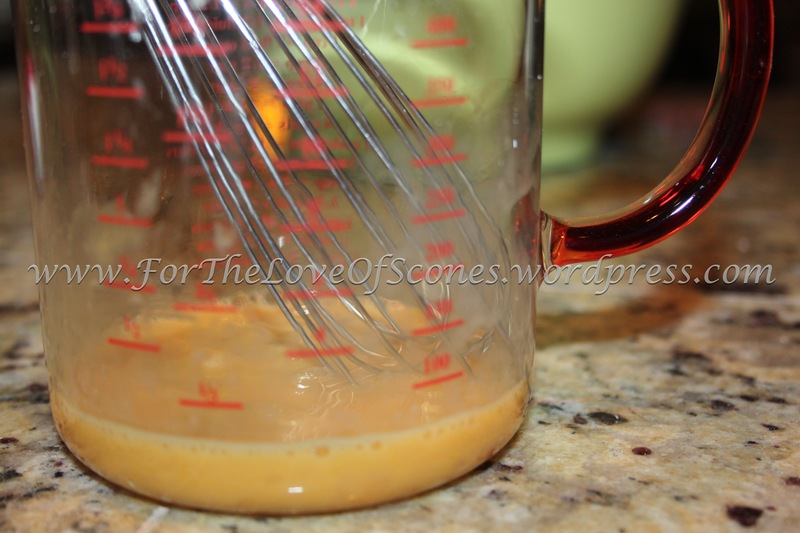 Combine the egg and vanilla extract and whisk lightly to mix. Whisk the egg & vanilla mixture together with the Greek yogurt until smooth. 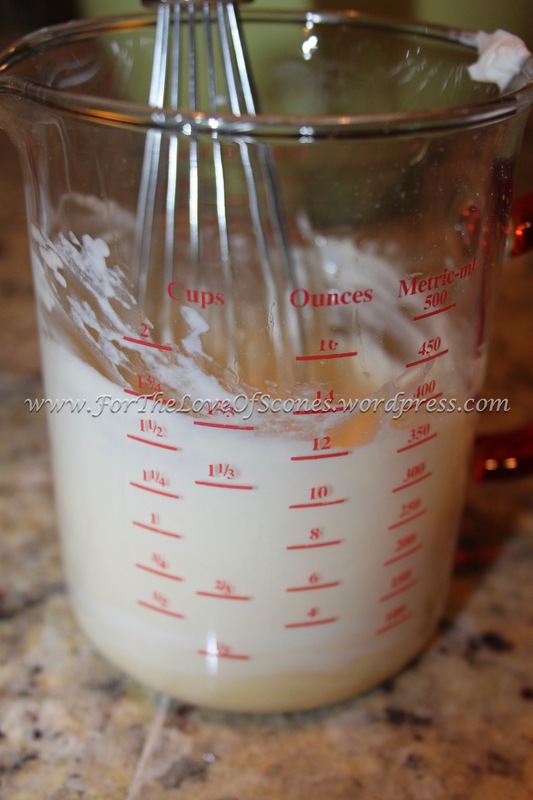 After adding the Greek yogurt mixture, you should have a dry-ish mixture that does not stick together yet. 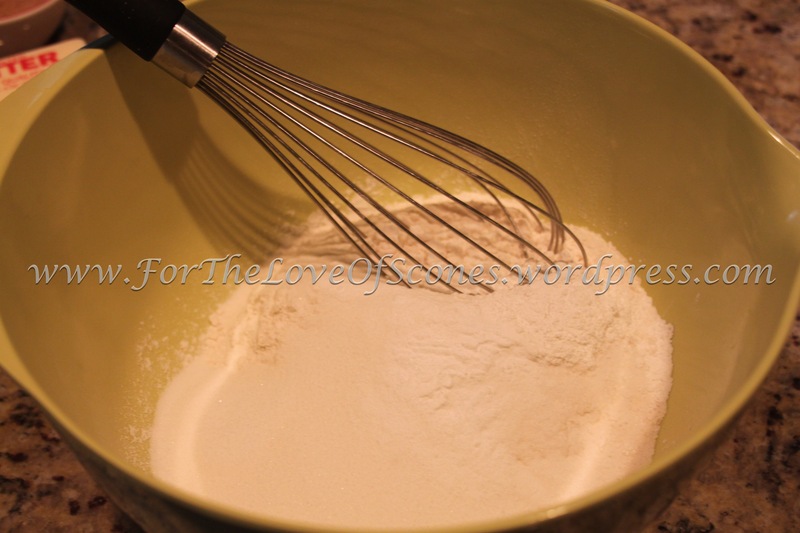 Add the yogurt, egg, & vanilla mixture to the dry ingredients and combine with a wooden spoon. Add the half & half as needed to bring the dough together. 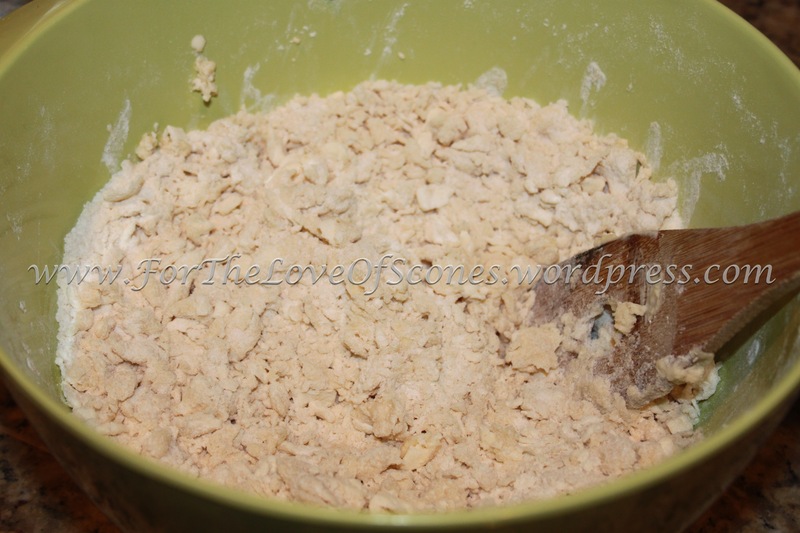 Add just enough so that the dough is mostly combined (a few crumbs are okay). 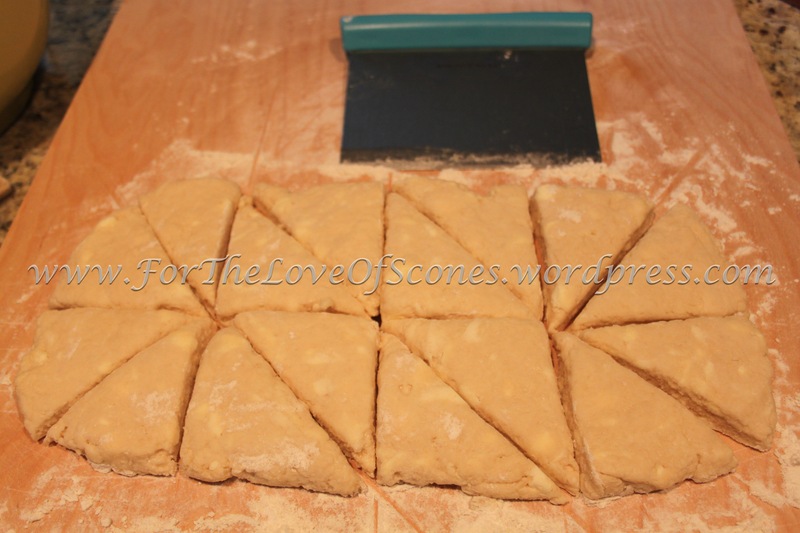 Give the dough a couple of kneads to bring it together, then flatten the dough with your hands into a log about two scone lengths in height and four scone widths in length. Divide into four rectangles, then cut each rectangle into two equal sized squares, then cut each square into two triangles, as shown. 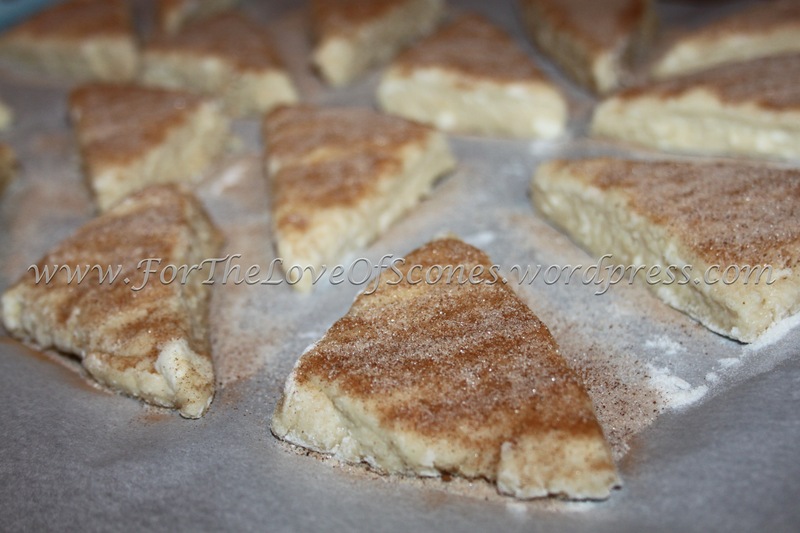 Press the sprinkled sugar lightly into the raw dough and spread the scones out to 1- to 2-inches apart. Remove to a towel-lined wire rack. Cool on a baking sheet lined with a towel, and drape a second towel over the top. Put on a plate, and enjoy! These came out surprisingly well, I thought. They were fluffy on the inside with a sugary, crunchy coating on top. They weren’t too sweet, either, and would be excellent alongside some coffee or tea. They are best warm, but are enjoyable cool, too. Thanks! They are sooo good, too! I was glad to get them out of the house, or I would have eaten them all!